Home Anime “In This Corner Of The World” Best Japanese movie of 2016? “In This Corner Of The World” Best Japanese movie of 2016? 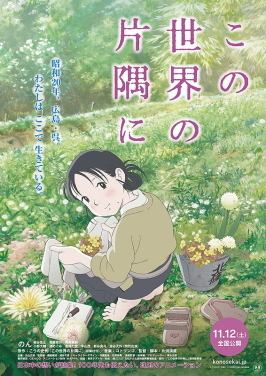 In This Corner of the World, is a Japanese animated movie based off the award winning manga Kono Sekai no Katasumi ni. Selling around 70,000 during just the January 21-22 weekend. The film has now earned 1.5 billion Yen ($18 million NZD). It also is currently screening at nearly 200 theaters! The film showed for the first time in 63 different Japanese theaters on November 12th. The film earned 18 million NZD in Just 2 days! This film had been named the best Japanese movie of 2016, by the film magazine Kinema Jump. In This Corner Of The World has also been awarded Katabuchi with the Best Director Award! On the 71st Annual Mainichi Film Awards, In This Corner Of The World won the Japanese movie award of excellence! “Best Japanese movie of 2016”, “Earning 18 million NZD in Just 2 days”… Yep. This anime is definitely on my watch list now. Previous articleIs Sword Art Online Worth Watching? Next articleGordon Ramsey Anime Opening! Eva is one of the original three founders of OtakuNZ. She likes to go out and hang out with friends, as well as play games, and watch anime of course! Want To Eat ‘Kit Kat Sushi’?